I occasionally hand in poetry and short speculative fiction in lieu of academic papers. As you can imagine, this yields inconsistent results; I recently handed in two Shakespearean sonnets instead of a précis considering cultural norms within the context of education through the lens of an “offensive” television program of my choice. As satire, and his widow’s grief deflowered. Mere lack of taste from sobersided plot. Was higher purpose served by this assault? To follow in Swift’s steps did they aspire? To disinfect it was not their desire. They led us to their moral no-man’s land. To mock, or not mock, and to what end? And numb the heart to empathy and ruth. For cultures to live under one accord. The power of ‘vet’ corrodes collective choice. South Park Episode 150, “Hell on Earth.” On September 4, 2006, Steve Irwin, otherwise known as The Crocodile Hunter, died while snorkeling off the Great Barrier Reef after being pierced in the chest by a stingray. On October 26, 2006, South Park aired a show in which Satan hosts a Halloween bash in Los Angeles and chastises one of the guests for wearing a Steve Irwin costume, replete with stingray chest accessory. 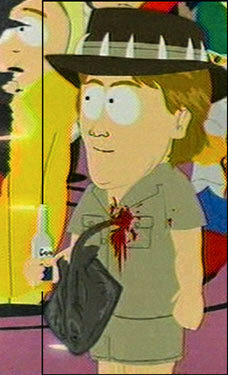 When said guest turns out to actually be Steve Irwin, Satan kicks him out of the party for not wearing a costume. Bad taste? It’s all in the eye of the beholder.